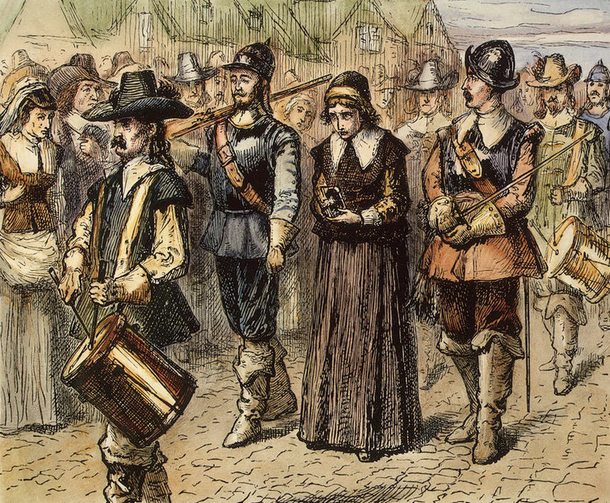 Mary Dyer being led to her hanging. When I was in seminary I had a Church History class with Dr. Richard Lovelace, a student of Yale College, Westminster Seminary and Princeton Theological Seminary. He gave us a list of Church history figures, and we were to write a paper on one of them. I asked if I could instead write a play on Mary Dyer, a Quaker martyr. He granted me permission, and it became my first feature-length play. Act One ends with her neck in the noose as she watches two of her colleagues swing. The second act culminates in her own hanging on the Boston Common on June 1, 1660. Their crime was worshipping Jesus Christ in a manner that seemed heretical to the Puritans of Massachusetts. The play has never been produced, but a reading of it was done at my alma mater, George Fox University, in 1999 when I was named alumnus of the year. While looking for a bio on Dr. Lovelace (which I never found), I came across a great interview on revival with him by Christian Book Distributors: An Interview with Author Richard F. Lovelace on Revival. Right now, we are sitting here looking at I don't know how much of the planet under the veil of Islam, the Moslems, that’s where I would expect Spiritual Awakening to spread to. If you are going to say that the Gospel is preached to every nation, I would say a powerful lot of Website, internet, or radio and TV communication would have to take place in the Moslem area. Also there is China, in which one recent figure said that 28,000 Christians are being made there everyday. If you project that for a decade or so, it will mean a very powerful spread of the gospel there. Christians may currently be partially disarmed or unarmed for Christian warfare, but if they tensed up the society would feel the brunt of this. Evangelicals are very strong on Scripture, tradition, and reason. Charismatics and Pentecostals have been real strong on experience, to some degree also on Scripture. They have not been at all involved deeply in tradition, and sometimes don't make enough use of reason. But what I see coming is a balance of all of this. My hope is that we will not have glossolalic and non-glossolalic communities all absolutely isolated from one another, but that we will have communities in which the nine gifts in 1 Corinthians 12 are displayed. Evangelicals could use some of these, words of knowledge, words of wisdom. I see more of a vanilla-fudge mixture coming in the future, where you can’t tell the Charismatics from the Evangelicals. If you are going to see this whole society revived the way it was in the first fifty years of the 19th century (1800-1850), you are going to have to have a massive educational revival. Because if you are going to find one toxic drip that has been dripping into us, it is our school systems. For the whole interview with Dr. Richard Lovelace, click here.